The Hottentot Venus (Saartjie Baartman) became the focus of scientific debate over racial inferiority waged at the Paris Academy of Science. 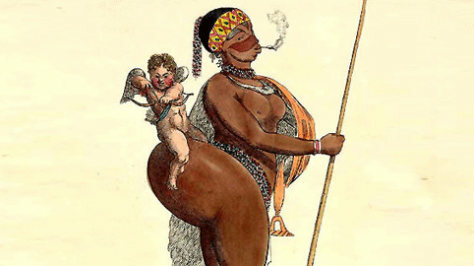 Baartman was exhibited in carnival-like shows across Britain that sensationalized her unusual anatomy: she had steatopygia, an over-development of fatty tissue around the buttocks and extended labia minora. A court battle failed to free Baartman from her exhibitors, and in 1814 she was taken to Paris. Her remains were finally returned to South Africa at the request of Nelson Mandela in 2002.